KUALA LUMPUR (May 25): The Malaysian Aviation Commission (Mavcom) had today issued a show cause letter to Rayani Air, after an evaluation on the airline’s commercial standing and capabilities to continue as an Air Service Licence (ASL) holder. 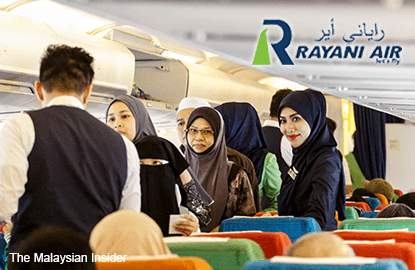 In a statement today, Mavcom said Rayani Air was required to submit its representation in writing within 14 days before the commission decides whether Rayani Air should be allowed to continue to hold the ASL or whether it should be revoked or suspended. "Matters relating to the issuance, suspension and revocation of an ASL come within the scope of responsibility of Mavcom since its establishment on 1 March 2016. In order to operate a passenger and cargo airline business, Rayani Air requires both an ASL and an AOC (Air Operator's Certificate). Should Mavcom revoke Rayani Air’s ASL, Rayani Air is no longer allowed to provide air transport services commercially in Malaysia. "In the meantime, it is advisable that consumers refrain from making any flight arrangements with Rayani Air, to ensure that they do not face any inconvenience in their travels. In addition, Mavcom will work with the relevant parties to assist affected consumers," Mavcom said. Mavcom's evaluation on Rayani Air, followed the provisional suspension of Rayani Air’s AOC by the Department of Civil Aviation on April 11 this year.